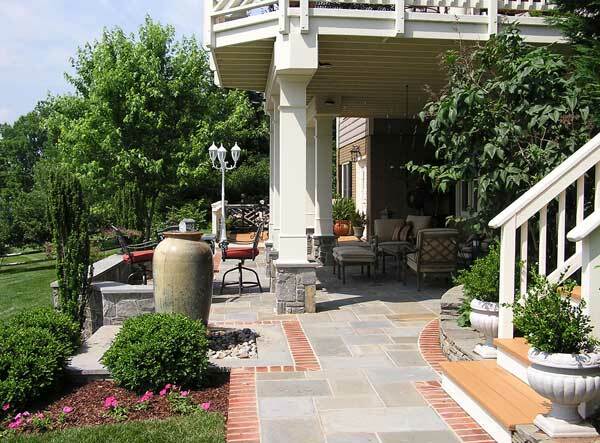 In this formal landscape, green, red, and floral plants delight the eye, while a walkway made of paver-like stones connects two large patios for gracious entertaining. 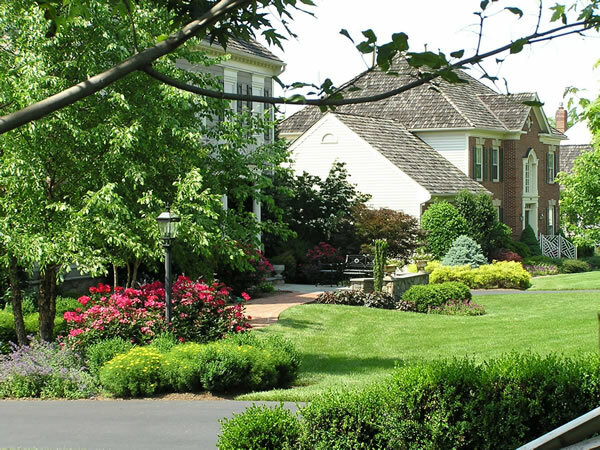 Beautiful color in a lush landscape has curb appeal from every angle. 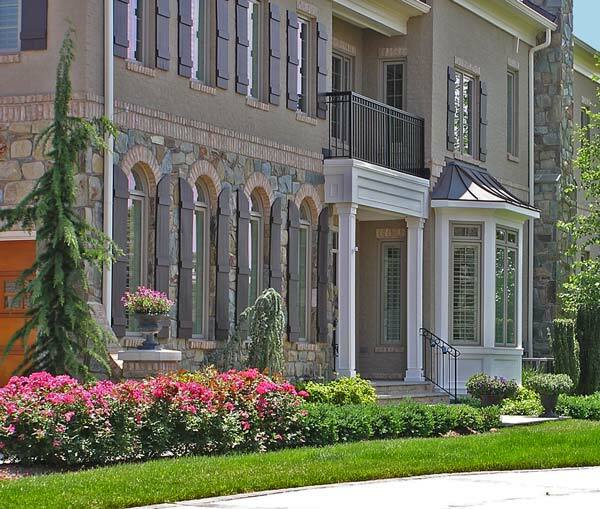 A perfect balance of color and scale enhance the architecture and entrance of a client's beautiful home. 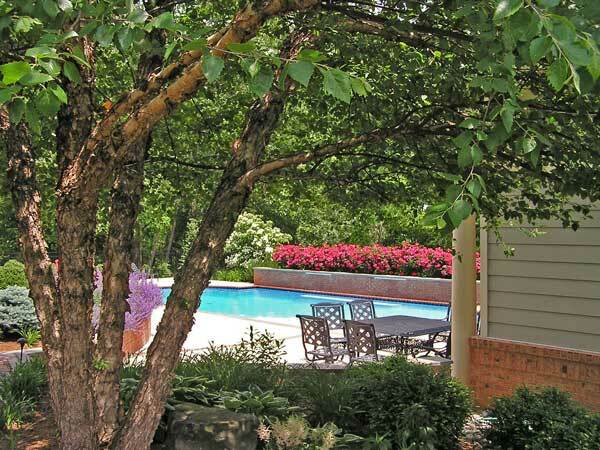 This backyard offers a bit of everything for family togetherness: a sun-drenched pool, beautiful, fragrant flowers, and shade for relaxed outdoor dining. Colorful shrubs, night-time lighting, and a bench provide a peaceful resting spot in a large lawn...and lead the eye gracefully to the landscape beyond. A few steps outside the house, and you're in a charming oasis for relaxing in the evening or entertaining friends and family on the weekends. 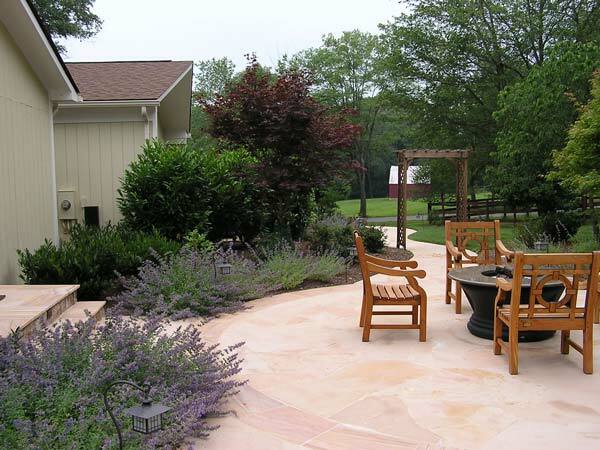 A meandering path of pink stone, colorful low and tall plants, and an arbor connect the house, patio, and yard with warmth and visual appeal. 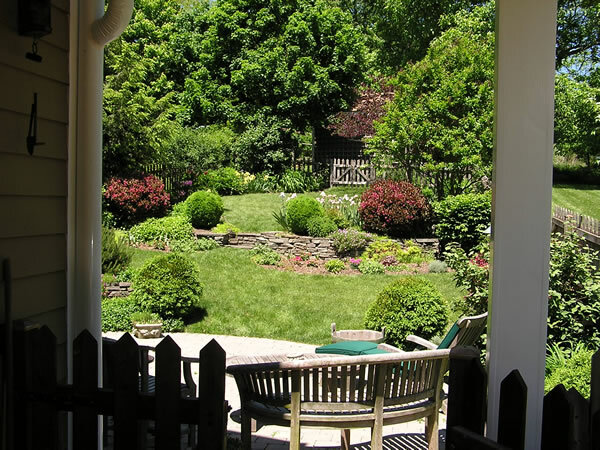 A multi-level yard provides beautiful opportunities for the creative use of space. 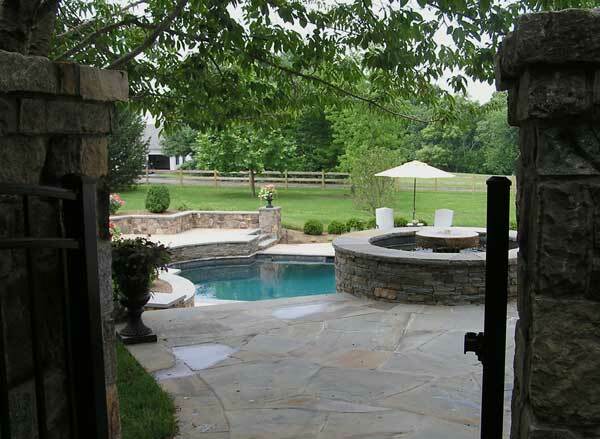 A round tower of tight stonework and a wide curved stone staircase provide an organic counterpoint to the lines of the house, fence, and pool. Multiple seating areas provide ample choices for relaxing, dining, or entertaining. Sometimes you need to make a really spectacular statement. 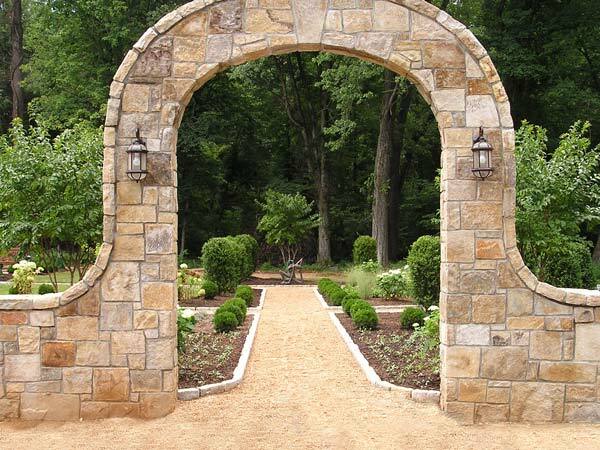 This custom stone arch, designed as part of a River's Edge Landscapes plan, was created by our own expert stonemasons. 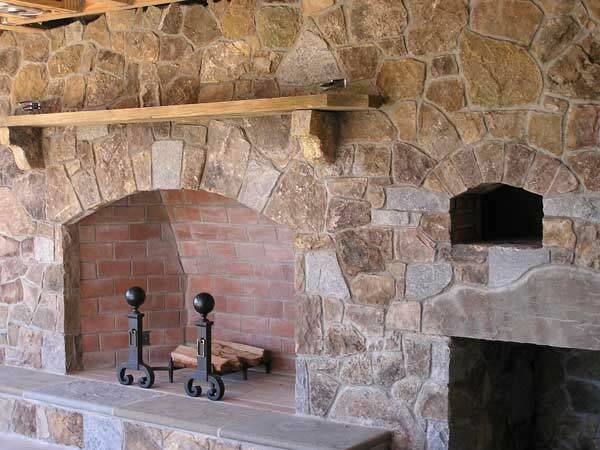 Our professional stonemasons are artists and craftsmen. 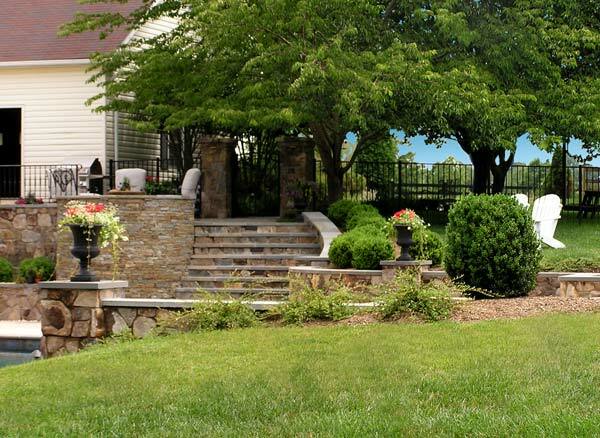 In this photo of a customer's custom stone wall and patio, with planting beds and sculpture niches, you can see the hallmarks of quality: tight, consistent joints, even textures, and clean lines. The result is stonework that looks gorgeous on installation, weathers beautifully, and adds to your home's value for years. 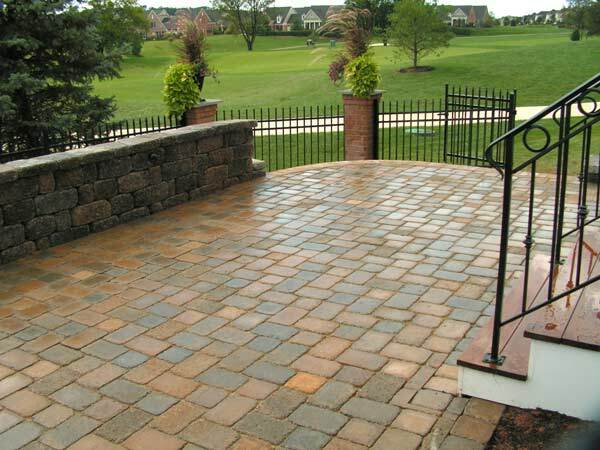 This multicolored brick patio and rustic stone wall was designed as part of an overall landscape plan by River's Edge Landscape designers, and built by our expert stonemasons. It will be beautiful and worry-free for years to come. 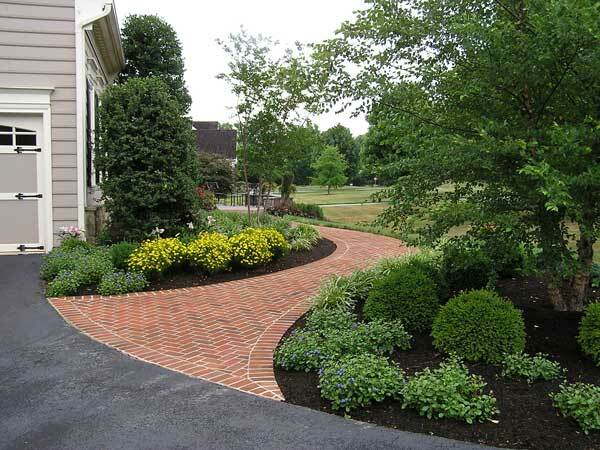 Herringbone brick that elegantly curves around oval planting beds transforms an ordinary walkway. This design gives our client's home great curb appeal and enhanced value. 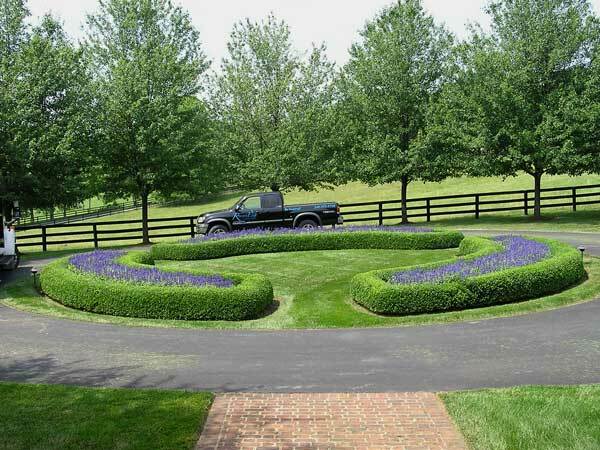 Tightly planted bright blue flowers with a small shrub border is a delightful way to enhance a circular drive. Openings in the circle invite visitors to step inside and enjoy the flowers and greenery. Our expert stonemasons created this large, multi-purpose outdoor fireplace for a River's Edge client. 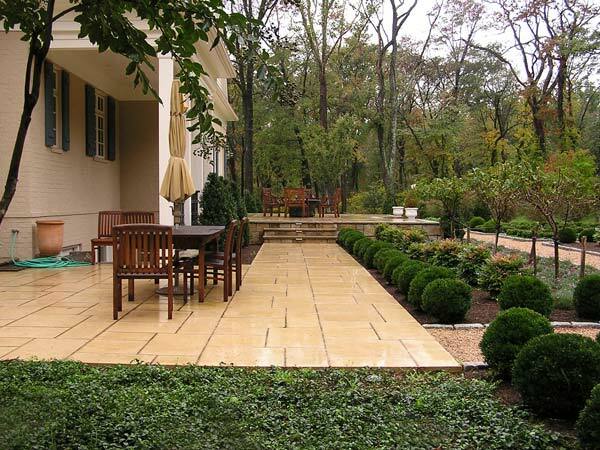 The straight lines and warm color of this flagstoen make it a perfect choice for connecting two patios in this formal garden. This design and installation transformed a dark, weedy and unusable space into an airy and inviting outdoor living room. We wrapped the existing support posts with gray stone and architectural wood columns. 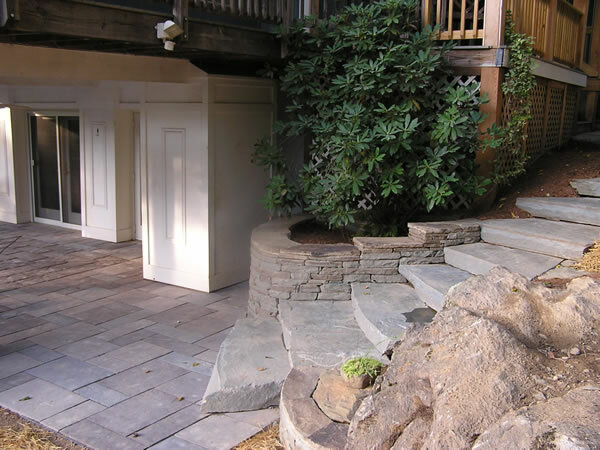 A stone seat wall and patio gives the space definition and expands it beyond the upper deck footprint. Finally, a simple urn bubbler adds a tranquil sound. 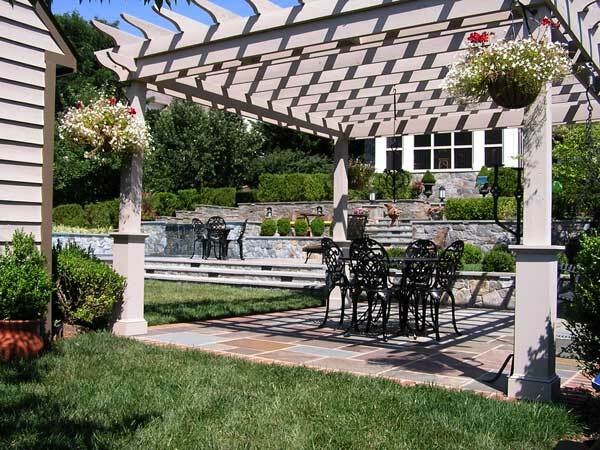 This custom pergola provides just the right amount of sun-dappled shade for a dining area, and works well with the rest of the custom stonework and plantings in this River's Edge Landscapes design. 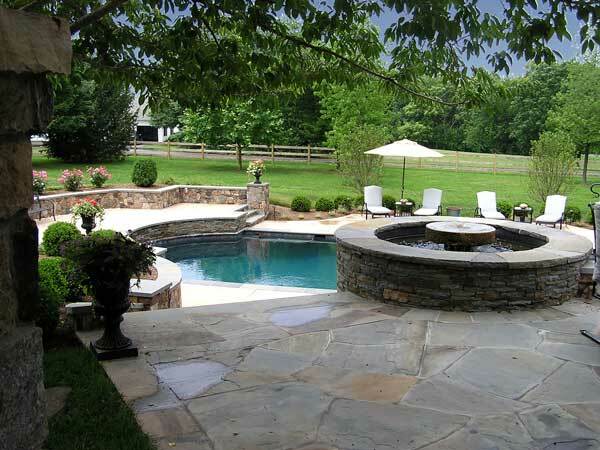 A combination of pool and fountain, surrounded by a custom stone deck, gives these homeowners a resort-like retreat without ever leaving home. 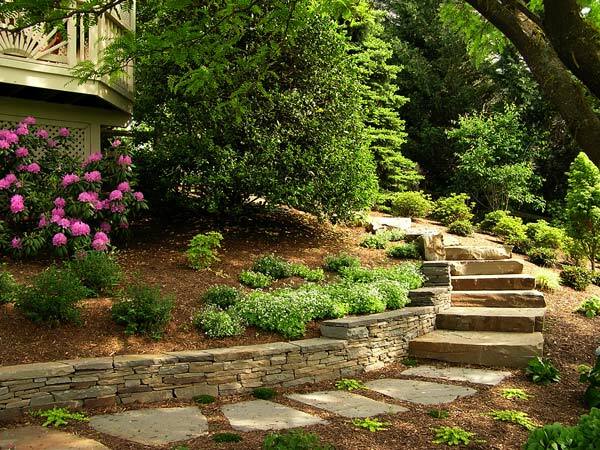 A small stone pathway through a garden winds around a house. A low custom wall of small, tightly set stones is beautifully scaled to match. A wide, gracefully curving stairway provides easy access for family and guests between two levels of a large terraced property designed for entertaining. 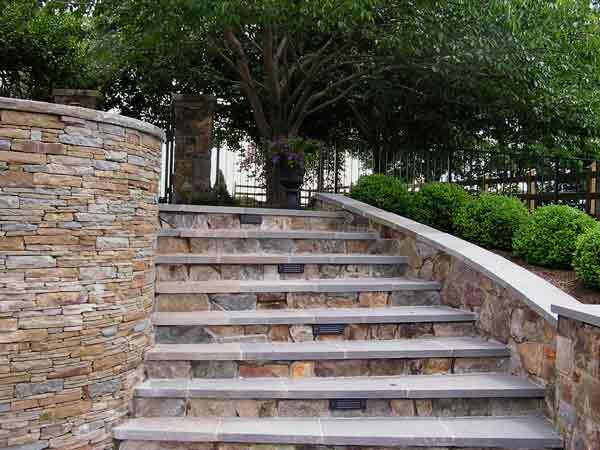 For clients that value a natural landscape, we designed a staircase that transitions beautifully into the natural stone beside it. The staircase looks like it's been there as long as the property itself. Imaginative design can turn a small, awkwardly-shaped space into focal point that pleases the eye and ear. At the home of this River's Edge Landscapes client, a flagstone walkway forms a bridge over terraced waterfalls. 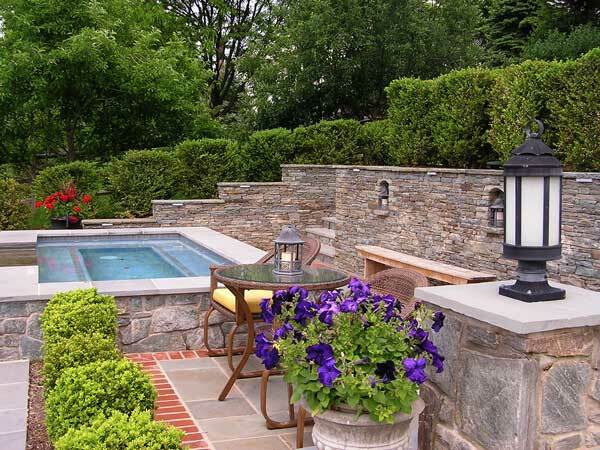 A backyard becomes an oasis for a busy family with this combination of custom fountain and swimming pool. 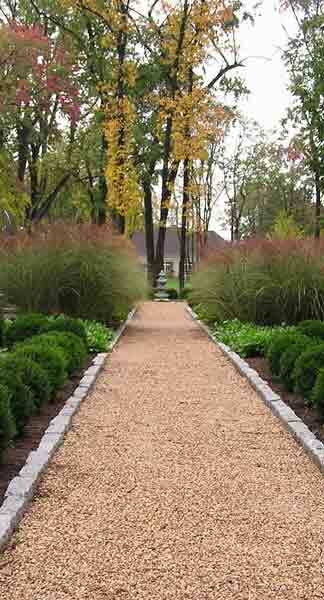 River's Edge Landscapes excels at designing mult-use spaces that fit large landscapes. Here, we created a harmonious blend of spaces for swimming, dining, entertaining, and relaxing while making the most of a beautiful view. 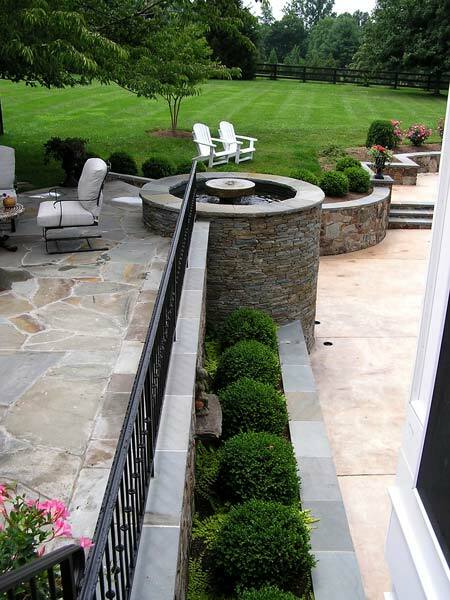 A perfectly straight stone wall culminates in a simple fountain atop a short custom stone tower. From the lower level, the effect is organic and harmonious. From the upper level, the effect is contemporary and beautifully dramatic. The drama of a steep terrace is echoed in a tall, natural stone waterfall at the corner of the property. 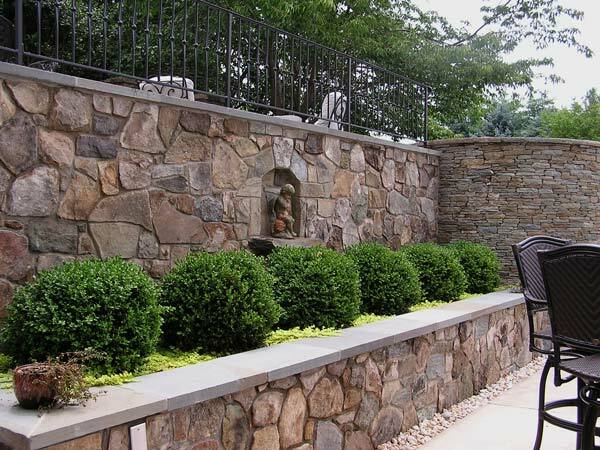 Shrubs border the house atop a niche-filled wall of tightly set small stones. Below that is a terrace with more planting beds, a seating area, and a spa. 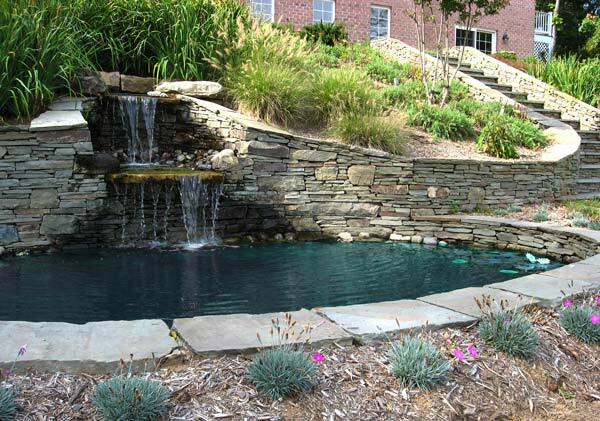 From the spa, a waterfall spills down the face of the stone into the beautiful expanse of a large swimming pool. The spa level of the terraced landscape takes advantage of the property's beautiful views, while providing an intimate space for relaxing. 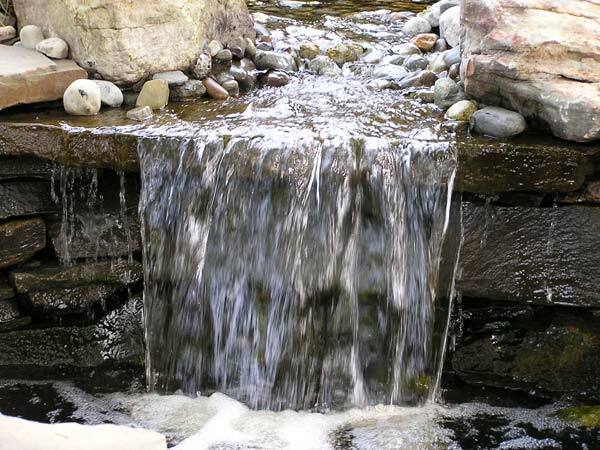 This River's Edge Landscapes waterfall plays over natural stone. 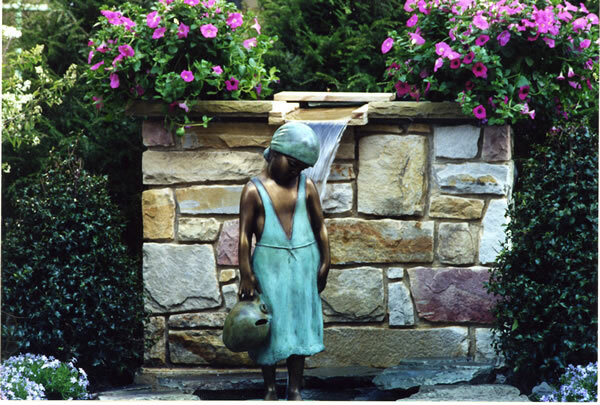 A custom stone wall and fountain with lush and colorful plants is a lovely and tranquil backcrop to a sweet bronze statue of a little girl who has broken her jug while fetching water. 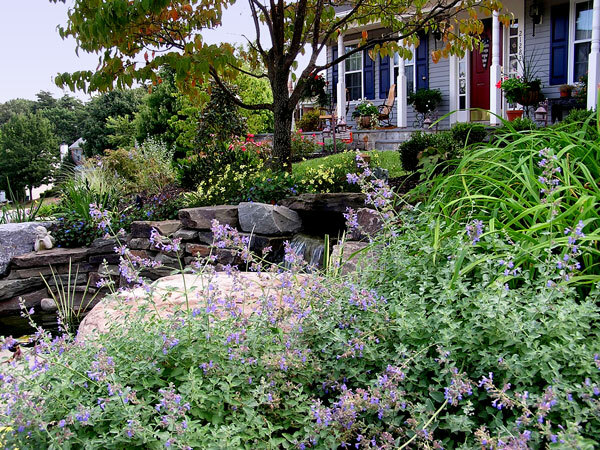 This original River's Edge Landscapes design is an award-winner. 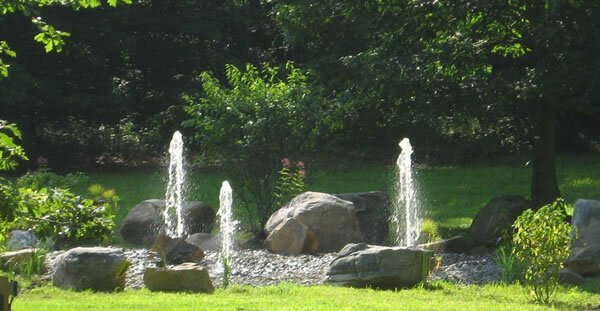 A natural-looking water feature blends harmoniously into a lush floral setting. 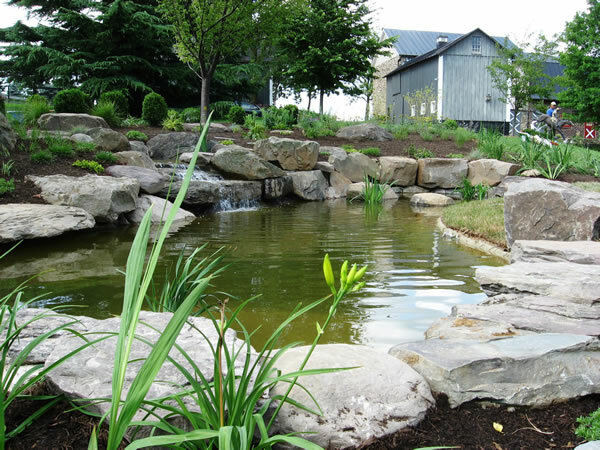 A natural-looking pond, bordered by natural stone, provides a place for serenity that blends into the Northern Virginia landscape. 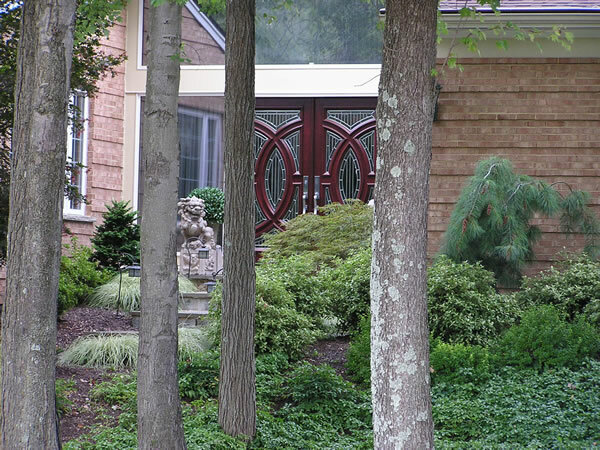 Three slender columns of water rise up in this formal landscape for a River's Edge Landscapes client. 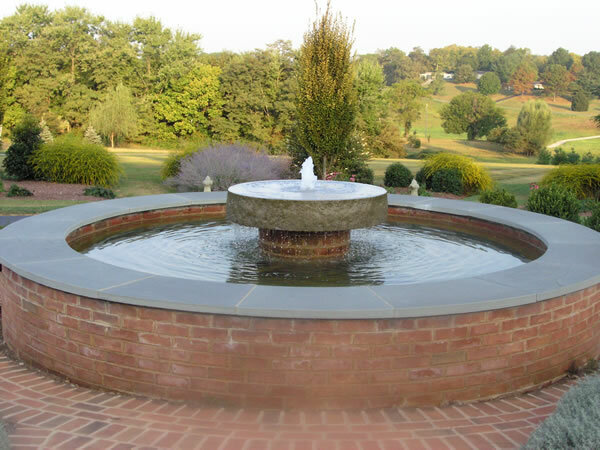 The classic simplicity of this large round fountain adds timeless beauty to any landscape. 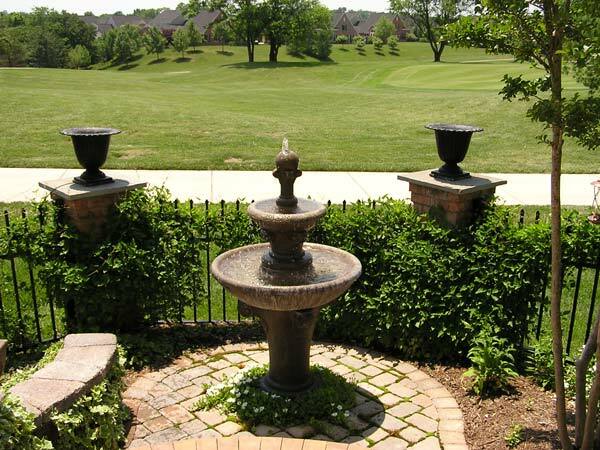 A small spot with a golf course view is the perfect place to enjoy the sound of a quietly splashing fountain. This fireplace and pergola is a River's Edge Landscapes creation. Water frows from under the mantle down the face of the stone to create a unique experience and breathtaking display. The fireplace and/or pergola are available for immediate purchase. Call for details. The relaxed feel and rustic accents of a cottage-style garden are perfect choices for this small, sloped backyard. Carefully placed plangings, a wedge of lawn, and a rustic stone retaining wall lead the eye up and away to the small wooden gate. 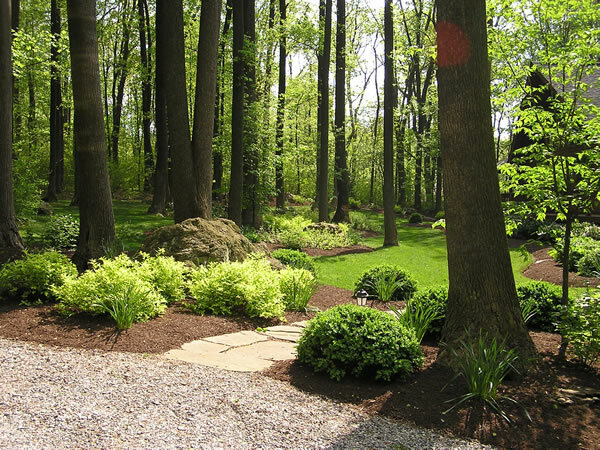 The effect turns a former drawback-- an uphill slope -- into a charming focal point, increases usable space, and makes a small yard look much bigger. 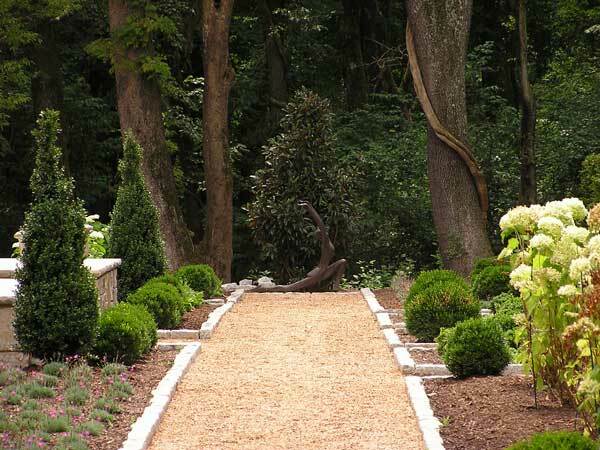 Our designers have studied gardens all over the world, and in many garden traditions. So when a client has a particular request, we can make their vision a beautiful reality. 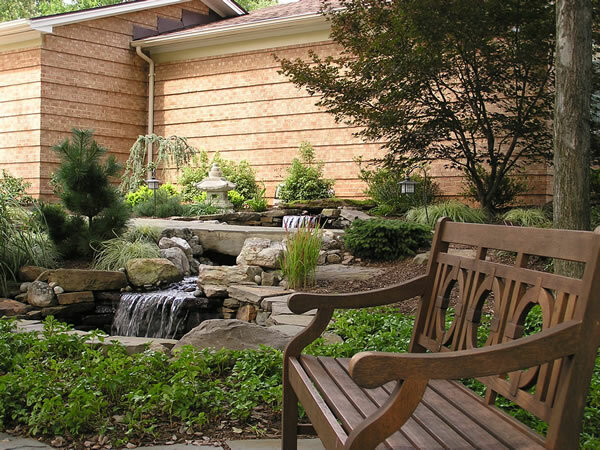 In this case, the plan, mood, and plant selections all contributed to the feel of a Japanese-style garden. The smallest touches can create the most memorable landscapes. 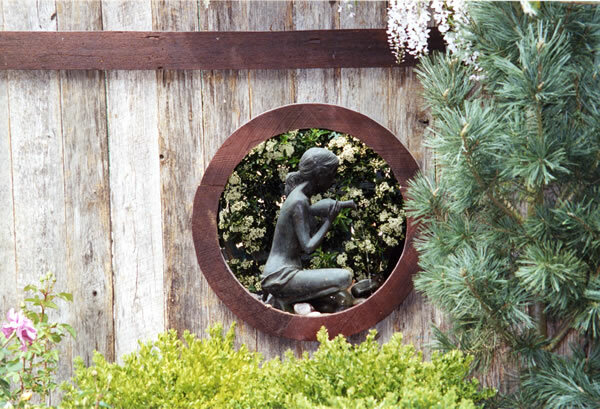 Here, a round window cut into an old fence adds a delightful surprise: a view of a small statue and water feature. It's a hint of the garden on the other side of the fence, an invitation to green, secret world, and a little bit of magic. 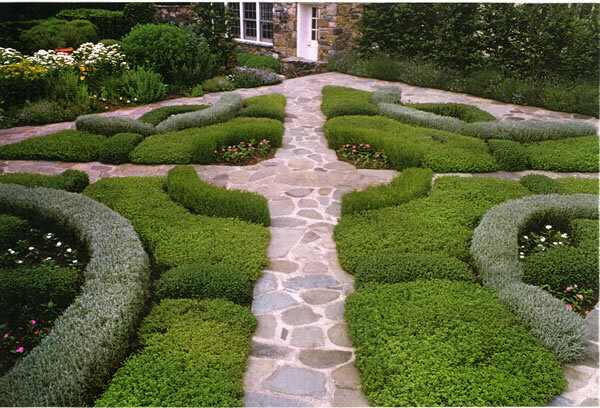 A lovely patterned herb "knot" garden ingludes thyme, santolina and germander. It's beautiful, aromatic, and a source of fresh herbs throughout the growing season. The formal lines, straight paths, and constrained beds of this large sculpture garden showcase artworks within a context of natural beauty. 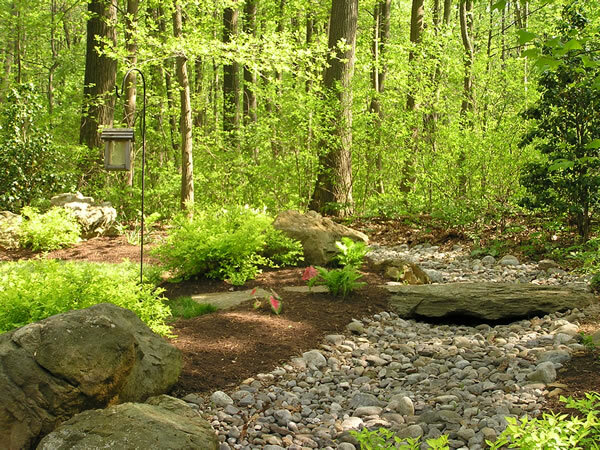 This looks like a pebbled creekbed that winds naturally into a welcoming forest grove. It's also a clever and pretty solution to the homeowner's challenging drainage problem. 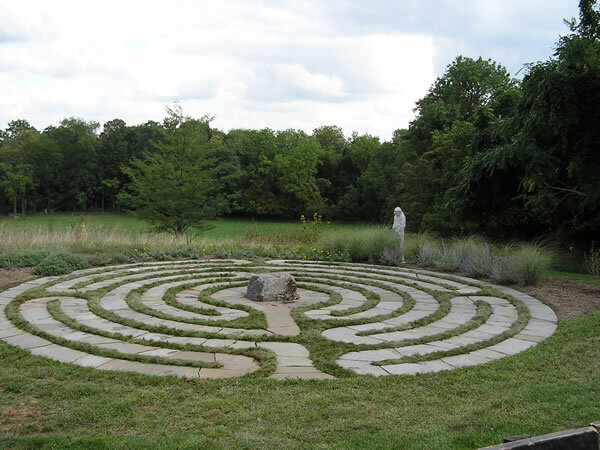 A centuries-old tradition in royal gardens, the maze continues to delight. 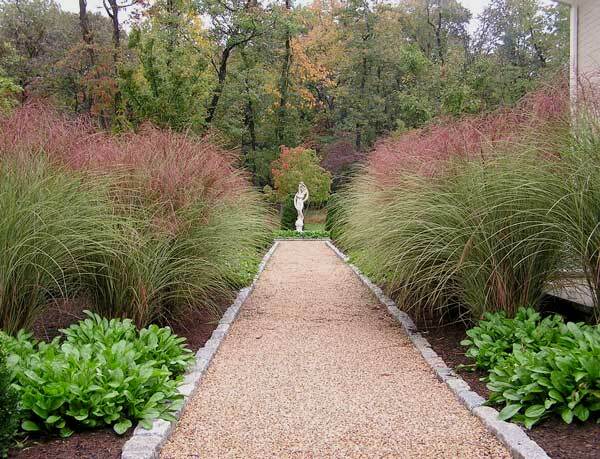 The orderly lines of a formal lanscaple showcase a surprising variety of plant color and form for an inviting garden experience. 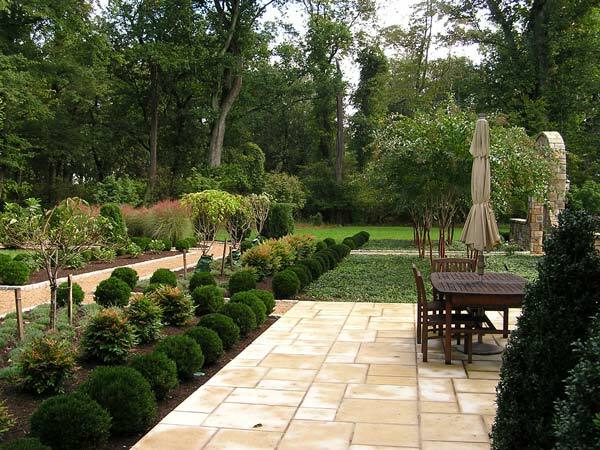 In a large garden with formal lines, it's important to keep providing fresh vistas. 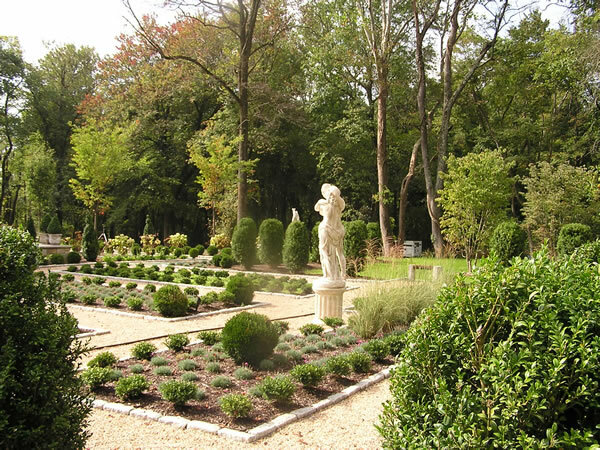 This vista in a large formal garden contrasts a slender white sculpture with lush, round, colorful shrubs, to the advantage of both artwork and plants. 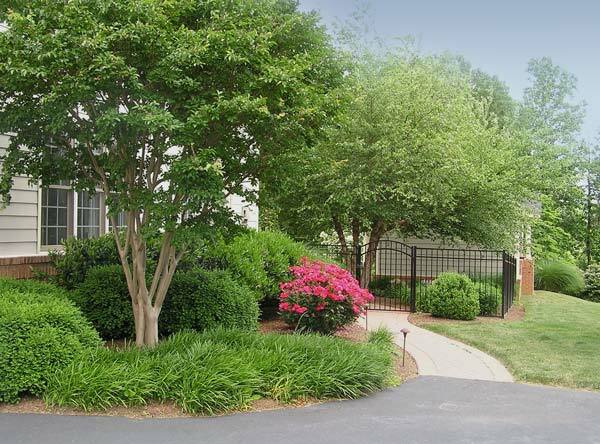 With the right plants and design, your landscape can look beautiful throughout the year. 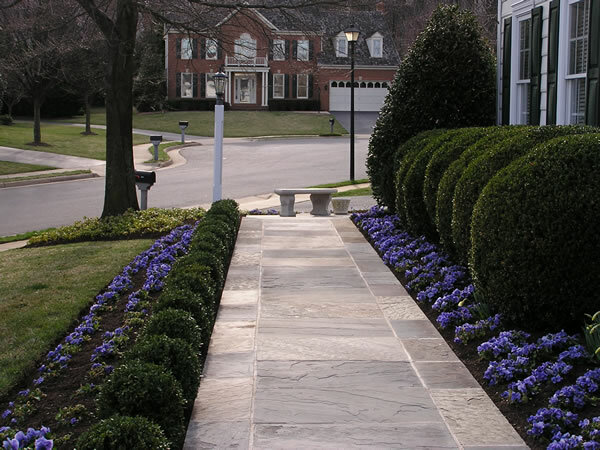 This custom stone walkway is lined with deep green shrubs and brilliant blue pansies. The rich color looks gorgeous through late fall, when dimmer light shows off saturated colors to wonderful effect. 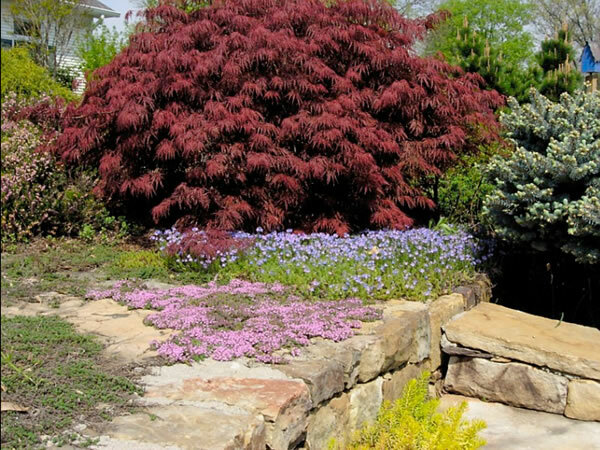 The brilliant red of a Japanese Maple is an eye-catching centerpiece to a colorful landscape. 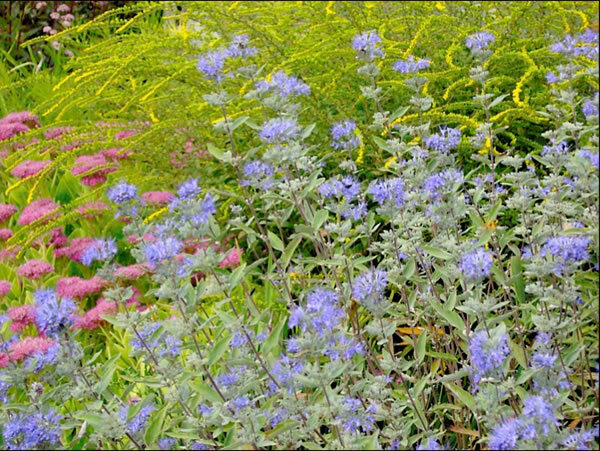 Masses of flowers give the feeling of a blooming meadow at the home of a River's Edge Landscapes client. 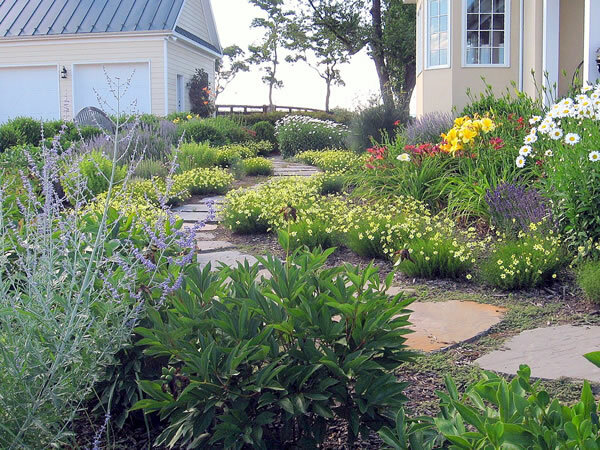 Large flagstones and gorgeous, multicolored blooms create a delightful and inviting pathway. A tiny pond is surrounded by masses of brilliant blooms. A bronze sculpture of a kneeling girl adds a contemplative touch. 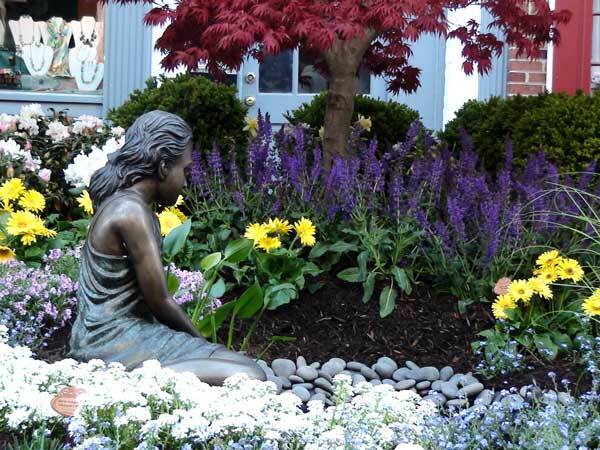 The sculpture and installation are available for purchase from River's Edge Landscapes. Call for details. This landscape is a study in contrasts: greens from pale silver to very deep; shrubs that almost seem to lay flat contrasted with elegantly tall trees; smooth texture of large leaves compared to finely textured small leaves, and finally, a pop of hot pink color. 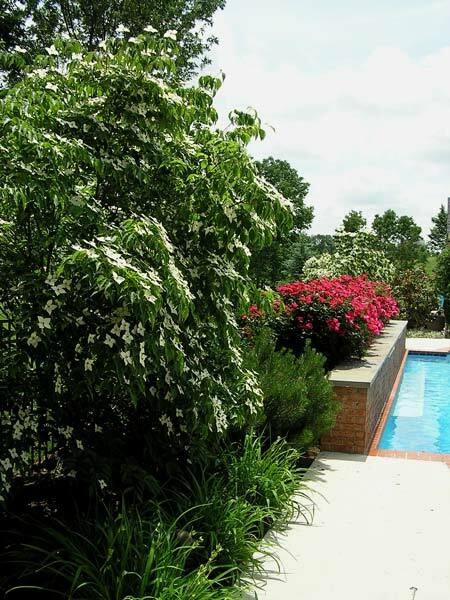 Floral and green plantings provide privacy and beauty in a pool area. 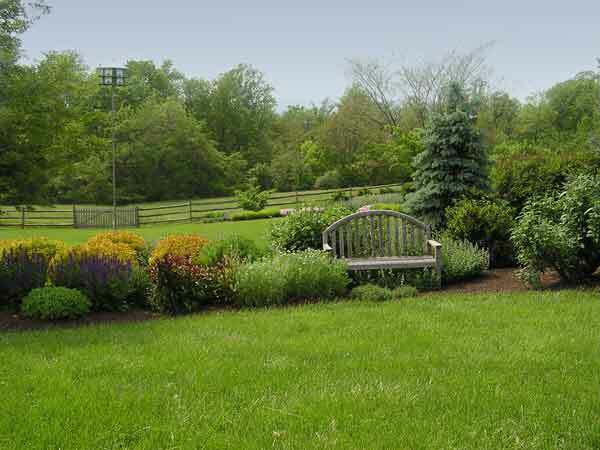 Our well-designed landscapes provide color, interest, and beauty throughout the year. 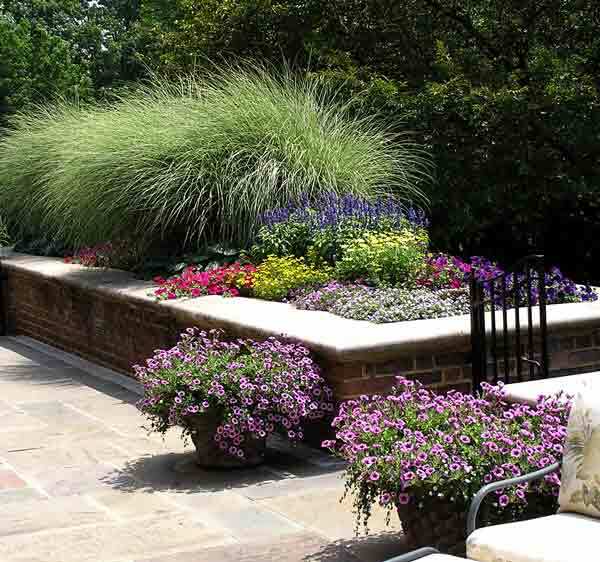 A raised flowerbed provides a new perspective on color and fragrance -- and casual seating for reading a book or enjoying a conversation with a friend.